If that doesn’t make any sense, here’s the real deal: An international team of astronomers found a series of strange shapes in data coming off of distant sources of radio waves. 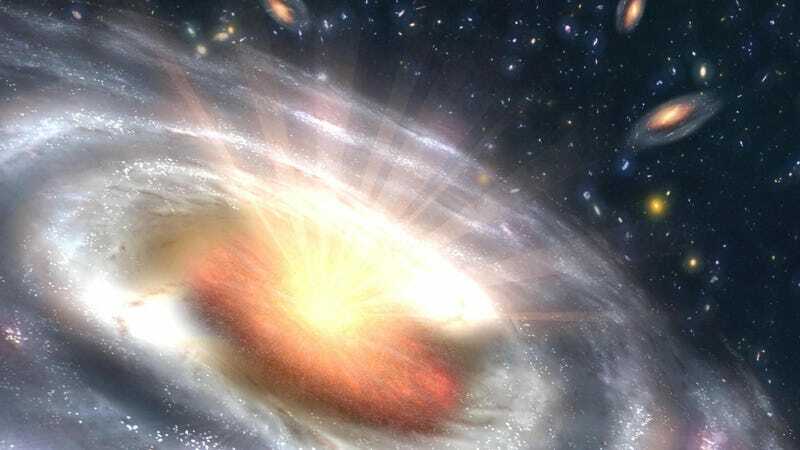 They hypothesize that the dips come from some mysterious sources passing in front of the light, maybe black holes or the centers of clusters of stars. If their hypothesis is correct, they think they may have found a new way to probe those sources—sources with masses difficult to observe by other means. These strange dips “may thus provide a powerful new method of exploiting gravitational lensing” for astronomy research, according to the paper published last week in the Astrophysical Journal. The researchers first noticed an increase and dip in the amount of light they observed back in 2009 coming from a distant source of radio waves. The pattern didn’t have a preferred wavelength (essentially, it didn’t have a preferred color), and the light returned right back to where it was in 2010, making a volcano-like cross section shape on a graph. They first thought that these shapes could have come from extreme scattering events, or clouds of charged gas, but the lack of preference for a dipping color clued them into the fact that they might be looking at some all-new source. After identifying the mystery, the researchers went looking to ensure that they weren’t just looking for some strange flares of light, and found another 10 of these volcanoes in seven radio sources after sifting through nearly a thousand. That makes these dips especially rare. The hunt and data analysis led the researchers to make their hypothesis: Maybe their observations come from objects between a thousand and a million times the Sun’s mass, like black holes. The volcano shape would come from gravitational lensing, the source bending the light from its strong gravitational field changing the shape of space. They had a few reasons: “A hallmark of gravitational lensing is its achromaticity,” its lack of preference for a color when it does its dimming, the authors write. Given that the authors have only presented a hypothesis, they also needed to give other researchers a way to prove it wrong: for example, further monitoring might give more information about the lens. More of these volcano shapes in the light emissions of further away sources, and they should behave the same on fast radio bursts as they do on quasars. I passed the paper to a few other researchers and will update the post if I hear back. But remember, there’s a whole lot of stuff scientists don’t know—so much that they use the unknowns to try and understand other unknowns.